The Showers Pass Men's Odyssey Jacket is a softshell barrier designed to conquer the urban jungle, making commutes easier and more comfortable during the winter months. Featuring a lightweight 3-layer waterproof and wind resistant softshell fabric, the Odyssey looks and feels good riding, walking, or lounging around thanks to the full-length zipper, large hood, and zippered hand warmer pockets. 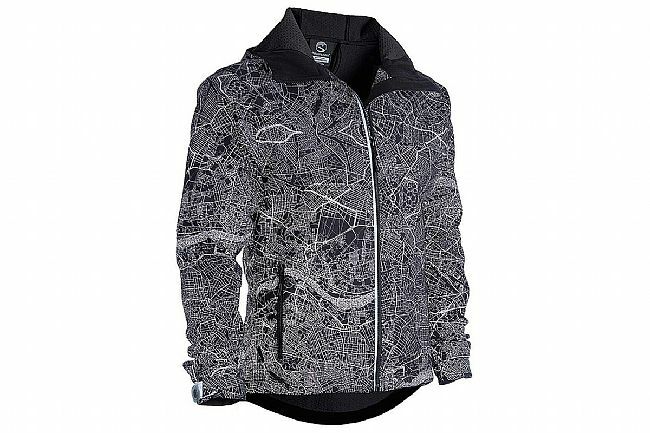 This versatile piece from Showers Pass will be the winter commuter's best friend thanks to the unique highly reflective MapREflect print, visible from 200 meters away for the ultimate in low-light visibility. 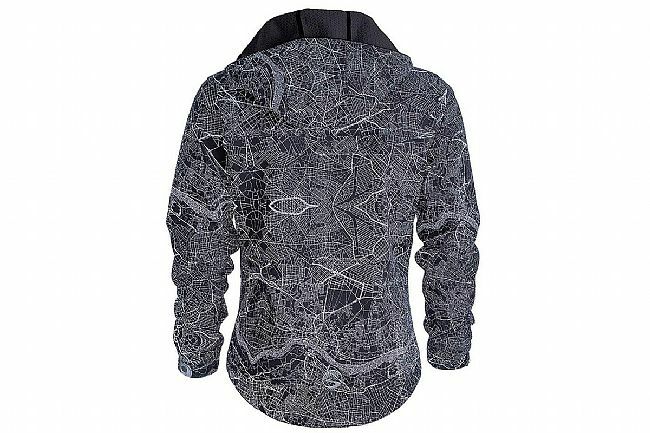 Literally eye-catching, this print draws inspiration from the 11 most iconic bicycle-friendly cities. Inside, boxfleece lining traps in and bolsters body heat for optimal warmth to fight off wet winter weather. An interior map pocket allows for safe storage of a wallet, or passport, while the zippered chest pocket houses a smartphone with an audio port for smart cable routing. 3-layer waterproof, breathable softshell material with durable water repellant (DWR) coating. Boxfleece lining retains and bolsters body heat, while wicking moisture away. Reflective sleeve cuffs cinch with metal snaps. Highly reflective MapREflect print is visible from 200 meters as headlights approach. Ergonomic easy-grip zipper pulls are easy to find even when wearing heavy winter gloves. Zippered hand warmer pockets with micro-fleece lining. Audio port in inside zippered chest pocket. Inside map pocket fits a passport. I really like this jacket but wish it didn't have a hood. 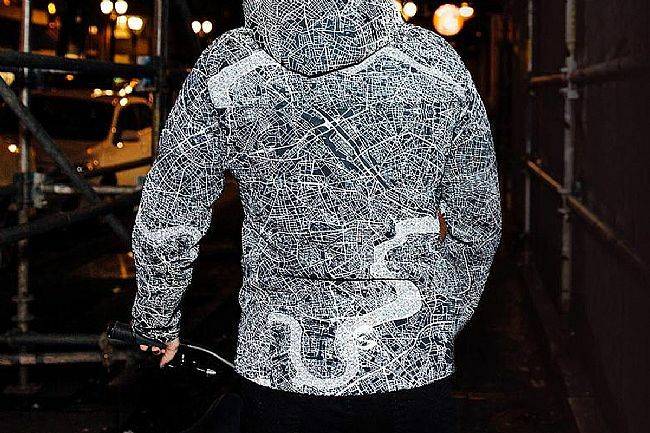 Otherwise the fit is right and it has all the necessary pockets and the reflective map looks really cool. It's a great buy even though it's not perfect. So I have ridden with this on both commuting and training rides in the Seattle winter. (aka Rain). It has good rain protection and a bit of warm in the form of a faux-liner. So overall quite a good product. Cons It needs a Napoleon breast pocket. The hood is useful but needs to be made removal-able. The description is lacking. First off it isn't the Electric Horseman the photo depicts. It does reflect light in a very noticable way, but not neon bright. The pattern is intriguing and stylish is the only word to describe it. Secondly, there are two inside pockets not one for a total of five pockets. Third, regular fit should be replaced with bike fit, as the back is cut longer and the sleeves are extra long to insure that wrists stay covered even in the drops. The cuffs also feature heavy duty snaps for loose or tight options. Big gloves can slip over the cuffs or the cuffs can fit over gloves. Lastly, the hood is big enough to wear over a helmet and can be cinched down to fit well without a helmet. I was expecting a thicker jacket judging from the photos, but it is just a shell, albeit a thicker shell than my other Winter jackets. This is not a deep winter jacket, at least not without a lot of help. I used my usual 2 layers with this jacket at just above freezing and it was a little chilly. That could be a good thing in longer rides because after 2 miles I wasn't beginning to overheat and at 6 miles it was quite comfortable. It is wind-proof so with thicker layers it should perform down to zero. Sizing is loose enough to cover a well fitted light jacket. I am a small large though. Overall this is a great find that I can actually use off the bike The construction is excellent and the little details, like the zipper, the warm pockets, and the little cinch cord keepers, make this a good value at full price. Especially so at BTD's price. I wish I had discovered Showers Pass before I spent too much for Rapha gear. 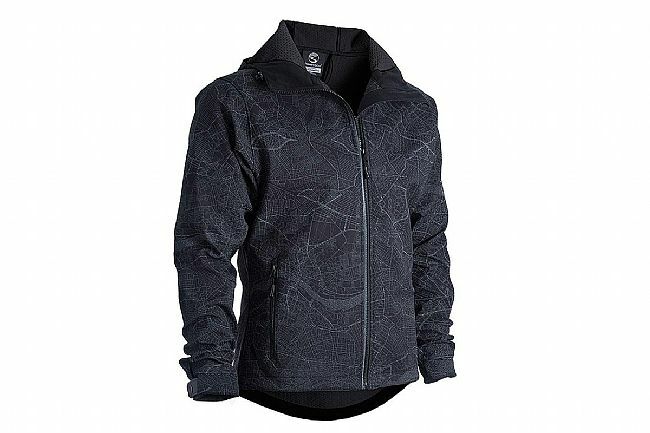 Nice medium weight jacket with night time safety reflective features... REALLY lights up when hit with direct light. Would have given it a 5 stars if it had a zipper venting system under the arms or on the front. I ride daily. I needed something to keep the rainwind off me, while not causing me to soak thru due to sweat. This jacket does all that and more. It keeps the rain out. It keeps the cold out. And it keeps me from sweating to death when it is eitheer of those conditions outside. I rode in today wearing a t-shirt and jeans in 35 degreee weather. The Jacket of enthusiasts ...or people who just like to stay warm when they ride.